Cultural landmarks and civic assets, well-designed museums can put unknown towns on the map, revitalize entire urban areas, ignite discussion about architecture and draw in tourists from around the world. From iconic and instantly recognizable contemporary structures like the Guggenheim Bilbao to subtle modern renovations and promising projects that have not yet been built, these 12 stunning museums and galleries designed by some of the world’s top architects stand out for their eye-catching visuals, respect for the landscape and history of their settings and sheer brilliance. Architects Jean de Castines and Shigeru Ban teamed up for this stunning expansion of the Centre Pompidou modern art museum in Paris. 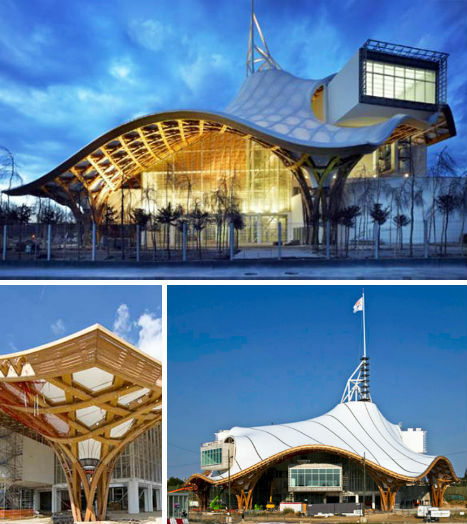 With an unusual form inspired by Chinese hats and bridges, the Centre Pomidou-Metz features a curving roof made of criss-crossing glue-laminated timber mesh covered in a waterproof fiberglass and Teflon membrane to preserve the works of art inside under the best possible conditions. At night the new facility glows like a lantern, beckoning visitors inside to view the works of modern visionaries like Vassili Kandinsky and Francis Bacon. 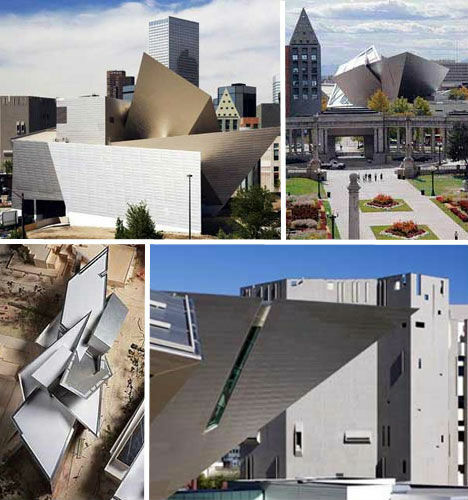 One controversial museum design is the Frederic C. Hamilton Building at the Denver Art Museum, envisioned as an echo of the “craggy cliffs” of the nearby Rocky Mountains by architect Daniel Libeskind. Sharp geometric shapes clad in titanium jut out from the earth in this 2006 expansion, which doubled the size of the museum. But even more so than the dramatic exterior, it’s the unusual interior that drew both criticism and confusion; the gallery’s angled asymmetrical walls hardly seemed fit for art installations. However, artists have met the challenge head-on with adaptive approaches that exploit the interior architecture’s transcendence of typical gallery archetypes. 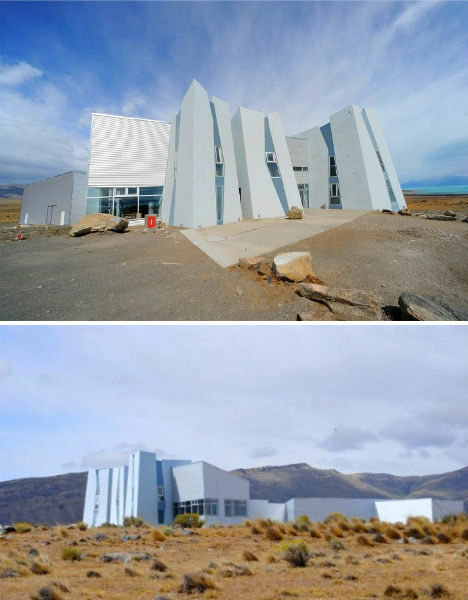 The new iceberg-shaped ‘Glaciarium‘ in Argentina’s Glacier National Park aims to highlight the importance of the region’s glaciers, acting both as a museum that educates visitors on the role that glaciers play in the environment and as a research institute that will monitor the 47 glaciers in the park. Despite the weight of the landscape features that inspired it, the museum sits lightly upon the earth, built on a steel frame that rests upon the natural level of the soil. Continuing the trend of modern museums and galleries that are not just housings for art, but works of art themselves, the Groninger Museum in Holland is an eye-catching collaboration between Alessandro Mendini, Coop Himmelb(l)au, Michele de Lucchi and Phillipe Starck. From certain angles, the Groninger resembles a massive geometric ship perched on the edge of the canal, an aesthetic that reinforces Holland’s watery landscape even as it clashes with the traditional architecture of the region. 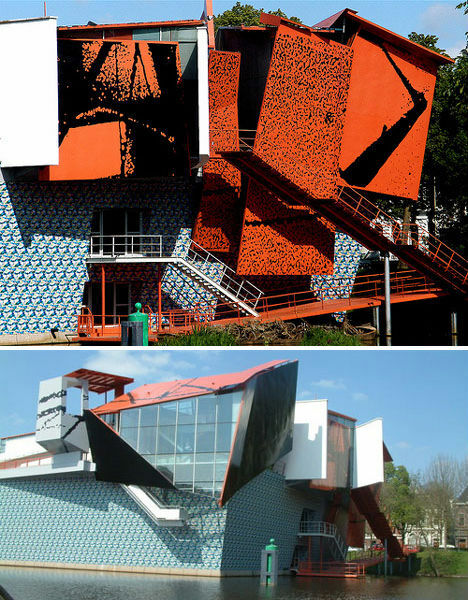 Deliberately provocative, the design of the Groninger Museum was not immediately popular with locals, but it has become an icon of the city since its completion in 1994. Originally completed in 1849, the Neues Museum of Berlin was nearly destroyed by bombs in World War II and sat abandoned for decades before restoration as a cultural landmark. 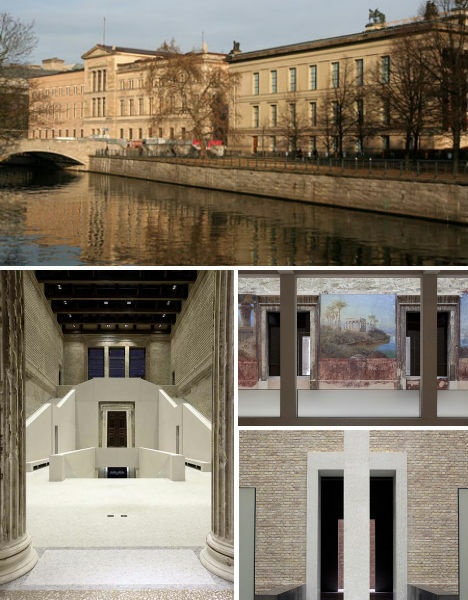 The renovation of the museum, orchestrated by David Chipperfield Architects, did not erase the wounds but rather preserved them to stand as visible testimony to the museum’s history, and that of Berlin. The architect set out to contrast the museum’s original refinement with the crumbling brick and bullet holes that resulted from the war, and added subtle modern elements that provide visual continuity without taking away from the narrative of the structure. The renovation won the 2011 Mies van der Rohe Award. 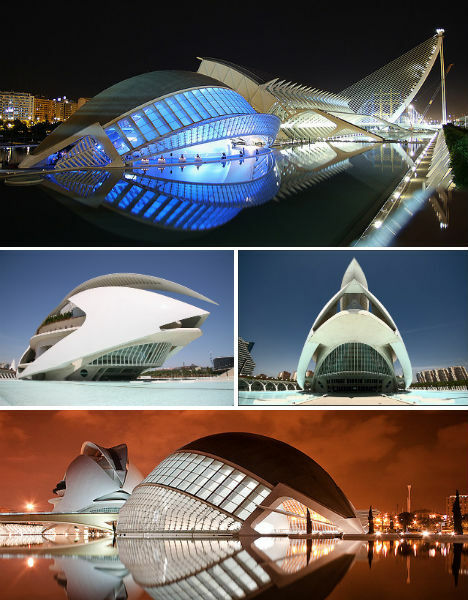 Renowned Spanish architect Santiago Calatrava has brought his fluid, soaring design aesthetic to cities around the world, but perhaps none mean so much to him as this sprawling museum in his own hometown of Valencia. Like most of Calatrava’s creations, the City of Arts and Sciences is skeletal and organic but almost alien-looking in its starkness. ‘City’ is an apt description for this complex, which includes an opera house, planetarium, science museum, palace of arts and underwater entertainment including theaters and restaurants. Occupying a dry riverbed in what was once an underdeveloped area of town, the City of Arts and Sciences is now Valencia’s top tourist destination, linking the city center to the sea. 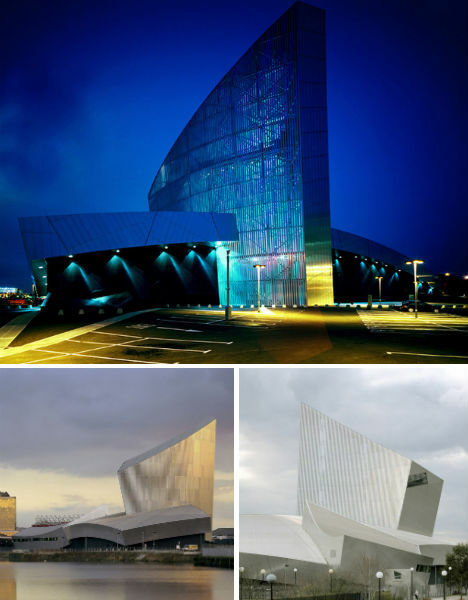 Located on the banks of the Manchester Ship Canal, Daniel Libeskind’s Imperial War Museum in Manchester, England is based on the globe, “broken into three fragments to depict the shattering effect of war on the history of the world.” Referred to as ‘shards’, the three fragments are situated to signify conflicts that took place on land, water and in the air. The Air Shard takes you 180 feet into the sky in the open air, looking down through a steel mesh floor, while the Water Shard overlooks the canal. The gallery floors in the Earth Shard are curved to replicate the curvature of the earth. 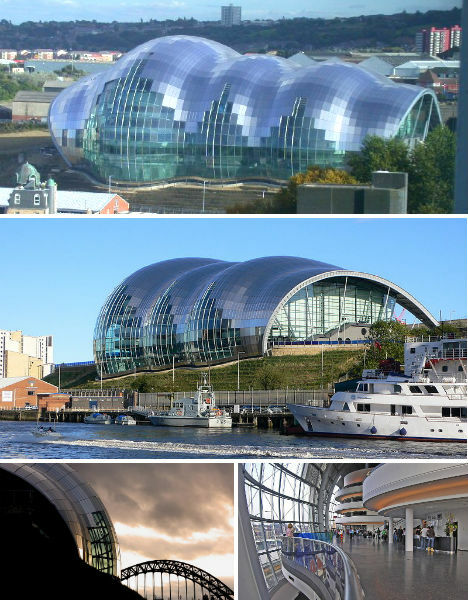 Transforming what was once referred to as a “post-industrial wasteland”, The Sage Gateshead by Foster + Partners cuts a dramatic, glittering silhouette on the River Tyne in Gateshead, England. The curved glass and steel building contains a 1,700-seat concert hall, a 400-seat space for chamber music and a rehearsal room that doubles as a small concert hall and orchestral recording studio. The Sage is also a center for music education, offering classes to the public. No detail was spared in the 10-year planning process, which involved musicians and resulted in such features as ‘spongy’ concrete to increase acoustics. 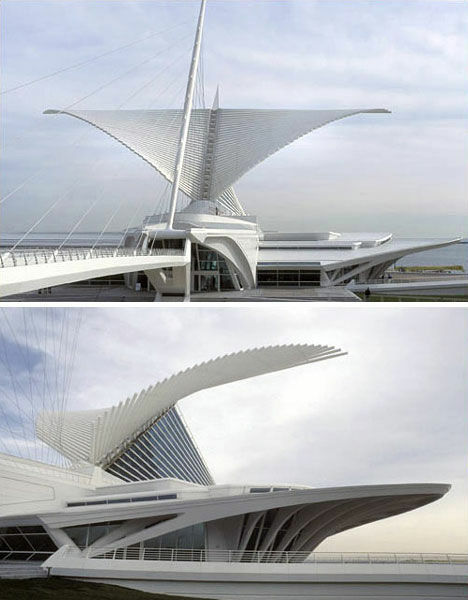 Soaring like the skeleton of a great mythical bird over Lake Michigan, the Burke Brise Soleil is Santiago Calatrava’s contribution to the Milwaukee Art Museum in Wisconsin. Bearing the architect’s signature style, the addition is a movable, wing-like sunscreen perched above the concrete Quadracci Pavilion, with a wingspan comparable to a Boeing 747-400. It opens and closes throughout the day, controlling both light and temperature inside the museum and automatically closing when its ultrasonic wind sensors detect winds stronger than 23 miles per hour. The museum is home to over 25,000 works of art. 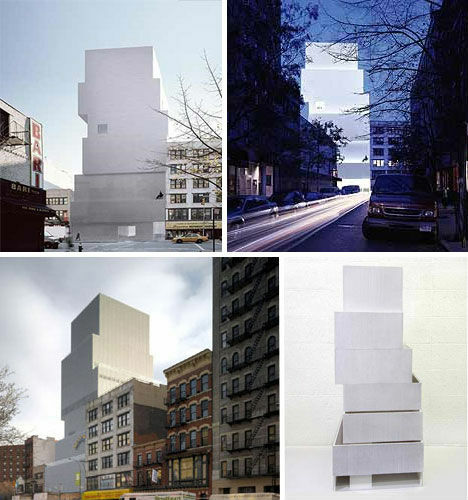 Tall, staggered and white, resembling nothing so much as a precarious tower of baker’s boxes, the New Museum for Contemporary Art – often referred to as New Museum on the Bowery – offers, as New York Magazine put it, “a magically unsentimental intrusion, an antidote to the generic luxury springing up around it.” Designed by Tokyo architects Kazuyo Sejima and Ryue Nishizawa/SANAA, the nine-level structure is the first fine art museum ever constructed from the ground up in downtown Manhattan. Opening in December 2007, the New Museum is a pristine contrast to the grittiness of the Bowery’s reputation (which is changing today, as gentrification sets in). Clad in a seamless aluminum mesh, the structure is airy and spacious with lots of natural light yet few distractions from the world outside. 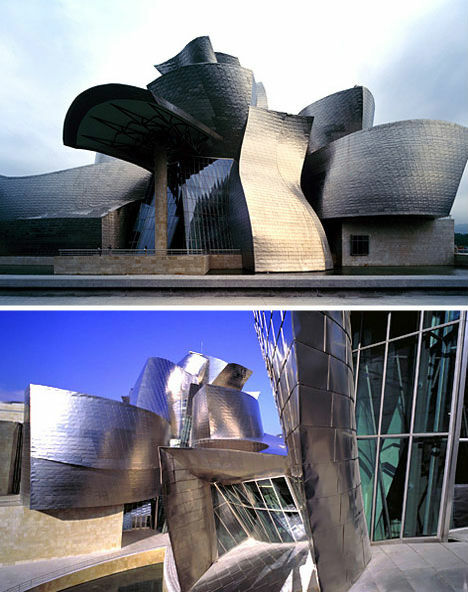 Perhaps no art museum in the world is quite as iconic as the Guggenheim Bilbao, which single-handedly put a relatively unknown small Spanish city on the map and stands out as a prime example of bold contemporary architecture. 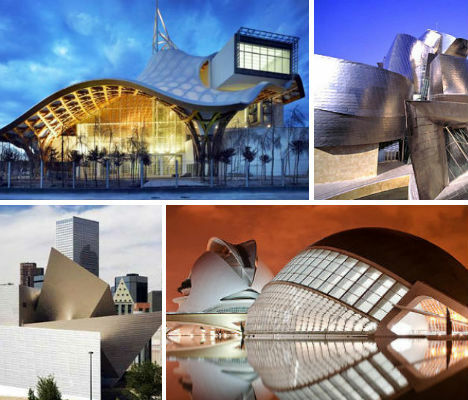 With a design that is both fluid and geometric, the light-catching, ship-like structure by famed architect Frank Gehry bears reflective panels resembling fish scales, reflecting the port town which serves as its setting and the river Nervión upon which it sits. 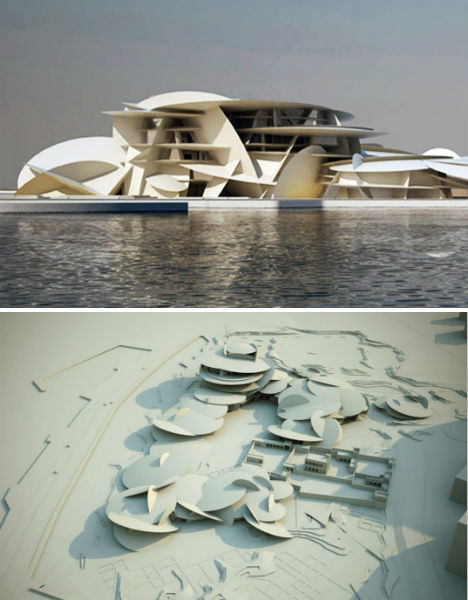 Inspired by desert architecture, the new National Museum of Qatar by Pritzker Prize-winning architect Jean Nouvel is made up of a series of interlocking discs which will create pockets of sheltered areas providing refuge from the harsh sun. The 430,000-square-foot cultural center, which will also include cafes, shops, offices and research centers, will be built around the historic Fariq Al Salatah Palace. From above, the complex resembles a caravanserai, a roadside inn providing refuge for desert travelers.